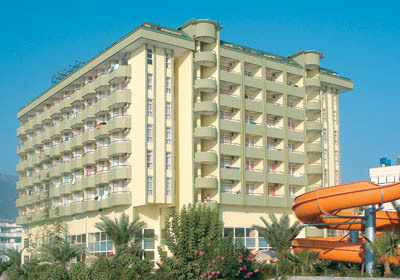 The Happy Elegant hotel is situated in Alanya, the centre of Alanya is just 7 km, the Antalya airport 130 km away. 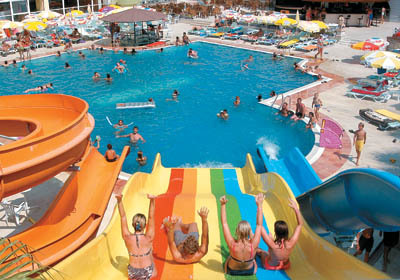 Perfectly positioned along the beach the attractive pool with waterslides is ideal for relaxing days in the warm Turkish sunshine. 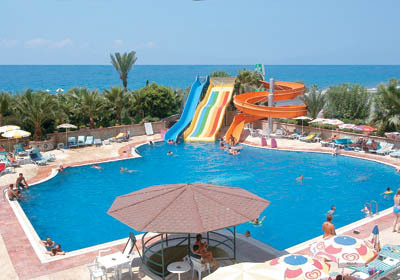 Reception * lobby * restaurant * 4 bar included beach bar * outdoor and indoor swimming pool * children’s pool * aquapark. Table tennis * beach volley * dart * tennis * fitness * disco (entrance). 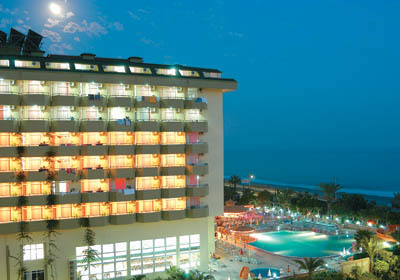 Room service * billiards * tennis with floodlight * squash * Turkish bath * sauna * massage * drinks in disco *food from a la carte menu *mini golf * alcoholic drinks on the beach * Turkish coffee* coctails * safe. Air-conditioning (central) * balcony * satellite TV * bathroom with hairdryer * telephone. With a sandy/pebbly private beach ( there is a private under - pass beneath the coastal road).Sunbedsand umbrellas available free of charge, mattresses payable locally. Open buffet breakfast, lunch & dinner. Late breakfast, coffee break, snacks on the beach (11.00-17.00), midnight soup.